For many reasons, Maui is an ideal choice for golfers when planning a Hawaii golf vacation. In addition to being a favorite spot for honeymooners and romantic getaways, there are few better things to do than play some of the Pacific's most spectacular golf courses. Maui's topography is dominated by the West Maui Mountain range and the 10,000-foot-high Mt. Haleakala volcano, joined by the Kahului Isthmus, where the majority of locals reside in the main port city of Kahului. No matter where you are on the island, golf is right around the corner. Maui's peaceful south shore is located at the base of Mt. Haleakala. Islanders have found refuge here for centuries, thanks to a location shielded from the brunt of the trade winds, where the waters are usually peaceful. Today, the sunniest and calmest fairways to be found in all of the Pacific. Wailea Golf Club has three 18-hole golf courses, side-by-side Wailea Gold and Wailea Emerald, both of which are Robert Trent Jones Jr. designs that wind around black lava rock and lush vegetation. Just north is the Old Blue at Wailea, which is a Maui classic and the grandfather of resort golf on the south shore. The southernmost golf resort on Maui is a few miles down the road from Wailea, at Makena Golf & Beach Resort. Less trafficked than just about everywhere else on the island, true peace and spectacular views are the reward to those who seek it out. Heading westward from here is the bustling port city of Lahaina, which was once the ancient capital of the islands. Nearby is Ka'anapali, home to a collection of beachfront resorts and two 18-hole courses, including the famed Royal Ka'anapali. Just a few miles up the coast from here are 36 holes of entirely different but equally spectacular golf, the Kapalua Plantation Course, which hosts the PGA Tour Tournament of Champions and Kapalua Bay courses. In addition to these resorts, daily-fee courses like the Dunes at Maui Lani, Kahili Golf Course, Pukalani Country Club and Elleair Golf course, as well as private King Kamehameha Golf Club, serve up a course for every taste and budget. The best part about the Maui golf scene is the furthest distance between two golf courses, Kapalua and Makena, isn't more than a 90-minute drive, so stay on the island long enough and you can see them all. You have seven days in Maui and you're looking to get the most bang for your golf buck. Where to start? Well, we have you covered. Here's a seven-day golf explosion that will let you see and play some of the best courses in one of the world's great golf destinations. Load up the car, grab your map and let's go! 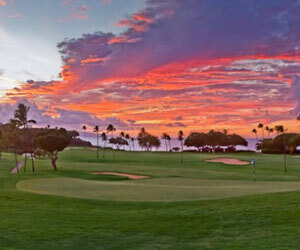 The Royal is the more challenging of the two golf courses at Kaanapali, but many locals prefer to play the Kai Course. Why? They have more fun on the Kai. For less skilled players, families and certainly players who don't hit it as far, the Kai fits the bill. And in terms of views, the Kai Course holds its own, too. Mike Bailey has more from Maui. What's not to like about the King? Great conditioning, a superb layout and views as good as almost anywhere in the world. Honestly, King Kamehameha Golf Club rivals the Plantation Course at Kapalua, and that's saying a lot. As for scenery, it doesn't get any better than King. Laid out along the side of the West Maui Mountains, you also get panoramic views of the Pacific Ocean as well. Royal Ka'anapali opened in 1962, the first developments on 1,200-acre Ka'anapali in Lahaina. It has hosted "Big Break Ka'anapali" on the Golf Channel, as well as the LPGA Kemper Cup and other televised events. This Robert Trent Jones Sr. design overlooks the ocean at most points and even plays right down toward the coastline on the long, par-4 fifth hole that finishes at a green right near the beach. Many new golf courses have come along since the Old Blue Course at Wailea Golf Club opened nearly 40 years ago, but Old Blue still draws the eyes of plenty of golfers. The original of the three courses at Wailea Golf Club on Maui, Old Blue is also the most unique, Brandon Tucker writes. The Emerald Course at Wailea Golf Club is one of three 18-hole plays at the south Maui golf course and resort development, and it's undeniably the most scenic of the trio. The Emerald, despite being overshadowed by the Gold Course in most rankings, is also the most played of the three courses at Wailea G.C. Located on Maui's southern tip is Makena Beach & Golf Resort, a secluded piece of spectacular Hawaii property. Formerly the Maui Prince Hotel, the resort has undergone an ownership change and major renovation project. Brandon Tucker shows us the resort and Robert Trent Jones Jr.-designed Makena Golf Course in this photo gallery. After a few tumultuous years, the buzz is back at Makena Beach & Golf Resort on Maui as the property is celebrating its 25th anniversary and wrapping up its first extensive renovation. The buzz, though, isn't too loud. Makena, after all, is meant to be a peaceful place, Brandon Tucker writes. Maui is one of the world's most beloved vacation destinations due to its weather, scenery, culture and activities -- especially golf. Brandon Tucker breaks down Maui golf by region and offers some other can't-miss destinations on your Maui vacation that will keep you coming back for more. HawaiiGolf.com's Maui travel FAQ can help when planning a golf vacation on the Valley Isle. What are the top golf courses on Maui? How do I find deals on tee times? Which courses have ocean views? What's the best time of year to plan a Maui golf trip? Do I need to rent a car? Brandon Tucker has answers to these questions and more.